Linda Sue Park began writing when she was in kindergarten, and became a professional writer when she published her first poem at age nine. She went on to become a journalist, a food critic, and an English teacher, but Park did not test her hand at writing fiction until she was in her mid-thirties, at the same time that she began to explore her Korean heritage in earnest. Her research resulted in a treasure trove of children's books, each of which delves into a different piece of Korean history. In 2002 Park was awarded the Newbery Medal for her third novel, A Single Shard, which follows the adventures of a twelfth-century orphan named Tree-ear. The Newbery is awarded by the American Library Association, and is given to the most distinguished American children's book published in the previous year. Park became the first Korean American to take home the honor. Linda Sue Park was born on March 25, 1960, in Urbana, Illinois, the daughter of Eung Won Ed, a computer analyst, and Susie Kim, a teacher. Her parents were Korean immigrants who moved to the United States in the 1950s; they were among the first wave of Koreans to migrate to America following World War II (1939–45). Once in the United States, the Parks did their best to assimilate to their adopted country and leave the past behind. As a result, Linda Sue grew up knowing very little about her family's background. As she explained in a Time for Kids interview, "My parents thought the best way to help us succeed was to become very American, which meant only speaking English at home. We celebrated certain holidays and upheld a few traditions, but I don't actually speak Korean." One way that Park was introduced to American culture was through books. In several interviews, she fondly remembered her father taking her to the library every two weeks beginning when she was very young. Because of those visits, Park became what she called a "maniacal reader." "It was by far my favorite activity," she told Cynthia Leitich Smith in an interview. Park read everything from Nancy Drew mysteries to award-winning children's books, and "everything in between." She also described herself as a re-reader, someone who comes back to old favorites again and again. Some of her all-time favorite writers were Laura Ingalls Wilder (1867–1957), author of the Little House series, and award-winning contemporary author E. L. Konigsburg (1930–). "One of the best things about writing is that it makes you a better observer—pay attention to people and things because you never know what might inspire a story." Reading was not Park's only passion; she also loved to write. She began to scribble stories and poems when she was still in kindergarten, and when she was just nine years old she had her first poem published in a magazine called Trailblazer. The poem was a haiku, a form of Japanese nature poetry that is unrhymed and composed of three lines containing a certain number of syllables: the first line has five syllables, the second has seven, and the third has five. Park was paid one dollar for her poem, which she gave to her father as a Christmas present. He framed the check, which still hangs over his office desk. Park continued to be published in magazines for children throughout elementary and high school. Park has claimed that she never consciously set out to become a professional writer, but she does admit that every decision she made revolved around her love of reading and writing. After graduating from high school she headed to Stanford University in Palo Alto, California, where she majored in English. "I majored in English," Park told Smith, "so I could read and write all the time." Not all of her time, however, was spent pouring over books. Park also participated in sports, and was an accomplished gymnast. In Korean history, kite flying can be traced back to 637 C.E. , during the first year of the reign of Queen Chindok of Silla, when a Korean general named Kim Yu-Sin used a kite to subdue a revolt. His army refused to follow his lead because they had seen a shooting star, which they believed to be a bad omen. To rally his troops, the general launched a kite carrying a burning ball; the superstitious soldiers thought the star (or bad omen) was returning to heaven, so they joined in the fight and defeated the rebels. Over time, kites were used for various military purposes, but eventually kite flying became a popular sport among Koreans both young and old. To this day, kite festivals are especially popular around holidays such as the Lunar New Year. Kite festivals gave birth to kite fighting. The purpose of a kite-fighting competition is to bring down all other kites—the last one remaining is the winner. A fighter kite is usually small and rectangular in shape. It looks quite simple in design, but it is actually very tough. The most popular type of kite, called a shield kite, is made from five bamboo sticks and covered with traditional Korean mulberry paper. Such combat kites are tail-less; it is the kite string that is the most important component since it is the key to a competitor's attack strategy. The silken string is reinforced with a layer of adhesive, such as rice glue or varnish. It is then coated with glass powder, ground pottery, or even knife blades—anything sharp enough for a flyer to cut his opponent's line and bring down his kite. In 1981 the aspiring author graduated from Stanford and took a job as a public relations writer for Amoco Oil Company. It was not exactly the kind of writing she had in mind, but it did give Park her first taste of professional life. While working at Amoco, she also met her future husband, a journalist from Ireland named Ben Dobbin. In 1983, when Dobbin returned to Ireland, Park decided to go with him. The two lived in Dublin, where Park studied literature at Trinity College. Park and Dobbin married in 1984 and moved to London, where Park attended Birkbeck College, earning a master's degree in 1988. The London years were busy ones. In addition to taking classes, Park had two children, Anna and Sean. She also taught English as a Second Language to college students, and tried her hand at a number of writing jobs. At various times Park worked as a copywriter at an advertising company and as a writer of restaurant reviews. And, of course, she continued to write poetry. In 1990 Park and her family moved back to the United States because of Dobbin's job. She taught English, and her poems were regularly published in small reviews. By the mid-1990s, however, she began to experiment with longer works of fiction. Park had dabbled in fiction before, but a turning point took place when she started to do some real research into Korean history. She was partly motivated to explore her roots because of her children, since she wanted to make sure they would have a chance to connect with both their Irish and Korean grandparents. It was also a personal journey. As Park explained to Cecelia Goodnow of the Seattle Post-Intelligencer, "It definitely was a personal sort of search for me." Park interviewed family members, and also dipped into her own memories, which included a visit to Korea that took place when she was eleven years old. Park was particularly inspired by a collection of Korean folktales that she had read as a child, called Tales of a Korean Grandmother by Frances Carpenter. Park began by writing short stories based on these Korean folk-tales, but an original story was taking shape in her head. She did not know whether it was meant to be a picture book or a short story, or something much longer. Several thousand words later it became evident that she was producing a novel-length book for children. That book would eventually become her first published work of fiction, Seesaw Girl. Writing a book for children seemed to come naturally to Park. After all, she had spent so much of her life reading children's books that, as she commented to Cynthia Leitich Smith, "the structure of those books got sort of 'hard-wired' into my brain." Park also felt that her years of writing poetry served as the perfect training ground for writing for children. "Children's books and poetry have a nice merging point which is no fat," she explained in an interview with the Alsop Review. "You can't write a lazy line or a line with too many words." Writing may have come easily to her, but publishing a manuscript did not. Without an agent or any connections in the publishing industry, Park initially sent her work out willy-nilly. As she told Smith, she "did absolutely everything wrong." By the time she finished her first long manuscript, however, Park had learned how to approach publishers in a professional manner. She submitted sample chapters of Seesaw Girl to six publishing houses; all six asked to see a complete manuscript. The book was eventually published by Clarion Books in 1997. Seesaw Girl is the story of Jade Blossom, a twelve-year-old girl growing up in an aristocratic household in seventeenth-century Korea. The custom of the times forbade young girls of social standing from leaving their family compounds until they were married. As a result, Jade is curious about the world outside, especially when Willow, her best friend and aunt, marries and leaves her behind. Jade arranges a day of escape, but what she encounters is not all beautiful, and she realizes that her family home provides not so much imprisonment as protection. When she returns to her family, she understands she must be content with catching glimpses of the world thanks to a stand-up seesaw built close to the compound walls. Critics especially praised Park for her faithful depiction of daily life in seventeenth-century Korea. As Barbara Scotto of School Library Journal commented, "Like Jade's stand-up seesaw, Park's novel offers readers a brief but enticing glimpse at another time and place." Park drew upon family experiences to flesh out aspects of Seesaw Girl. When Park was young, for example, her mother built a Korean seesaw for Park and her brother in their backyard. A Korean seesaw is similar to an American seesaw in that a plank of wood is balanced across a central point; the difference is that players stand on each end (instead of sitting) and jump. "It takes some practice," Park explained to Julie Durango on By the Book Web site in 2000. "The timing is quite precise—the 'jumper' has to take off at the exact moment that the 'flyer' lands." In her next book, The Kite Fighters (2000), Park again turned to family stories for inspiration, this time creating a work that would be a tribute to her father. At the center of the story is the rivalry between two kite-flying brothers, Kee-sup and Young-sup, who live in Seoul, Korea, in 1473. Kite fighting was a popular sport in the late fifteenth century, and each brother has his own unique talent. Older brother Kee-sup is gifted at kite design and construction, while Young-sup is a masterful kite flyer who has the ability to make kites dance in the wind. When the boy-king of Korea learns of their skills he enlists the boys to create a perfect kite for the all-important New Year's competition. In the book Park not only described the intricate world of kite fighting, but also explored the traditional roles the boys played, based on their position in the family. Park researched the art of kite design and the sport of kite fighting, but she especially relied on her father's expertise, since he had been a devoted kite flyer as a boy. After the manuscript was finished, Eung Won read over the text to make sure the descriptions were accurate; he also served as the book's illustrator, contributing the decorations that open each chapter. In addition, Park's father offered insight into his experience as a second son in a traditional Korean household. Reviewers paid particular attention to the fact that although Park's story takes place in medieval Korea, her characters face many of the problems siblings face today. The author was quick to point out, however, that historical accuracy is important. As she explained to Writer's Digest, "I want readers to be able to relate to the characters, but at the same time I want the characters to be grounded in their place and time." Park spends many hours on the Internet and at the library doing research for her books, and along the way she tucks away notes and idea for future stories. Back in 1996, while investigating the background for Seesaw Girl, she came across references to celadon, a type of pottery introduced in Korea that is considered to be among the finest in the world. "I liked that," Park commented to Writer's Digest, "the idea of a little tiny country being the best at something." As a result, in 2001, celadon pottery formed the basis of her award-winning book A Single Shard, which, like her previous works, takes place in early Korea. This time the action is set in the twelfth century and follows the adventures of an orphaned boy named Tree-ear, who becomes an apprentice to Min, a master potter in his village of Ch'ulp'o. 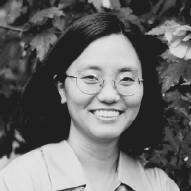 In an interview with Alsop Review, Park called A Single Shard her "once in a lifetime 'muse' experience," explaining that the book just poured out of her, page after page. Readers and reviewers agreed that Shard was indeed magical, and in 2002 Park was awarded the Newbery Medal, one of the highest honors in the nation for a children's book. She spent the better part of the next year traveling around the country, appearing at book signings and giving readings. She also became quite famous in Korea, making headline news and receiving congratulations from Korean well-wishers. The experience was all very "thrilling and humbling," Park told Durango. She had little time, however, to rest on her laurels, since Park was busy putting the finishing touches on her next book, which many claim is her most powerful yet, perhaps because it was a labor of love. When My Name was Keoko, published in 2002, is based on her parents' memories of growing up in Korea during the Japanese occupation of their country. After taking control of Korea in 1910, the Japanese government attempted to erase Korean traditions and customs, going so far as to make Koreans take Japanese names. "Keoko was my mother's Japanese name," Park explained in the Time for Kids interview. "That's where the title comes from." When Park was a young girl, her parents did not talk about their painful experiences, but after she began her research they opened up. "I asked them about their experiences," she told Durango, "and they did start talking. And talking ... and talking." Although based on her family, Keoko is a work of fiction that takes place in Korea in 1940. It is told from the perspective of a brother and sister, thirteen-year-old Tae-yul and ten-year-old Sun-hee, each of whom responds to their situation in very different ways. As World War II approaches, their lives are further threatened and their loyalty to family and country are increasingly challenged. It was a difficult story for Park to tell, and for her parents to revisit, but as she explained to Durango, "Your past is a huge part of what makes you you, and exploring the past can help you better understand the present and future." In the mid-2000s Park continued to explore Korea's past and present in several new books that were aimed at a younger audience. The Fire-keeper's Son, published in 2004, gave readers a look at Korea in the 1800s, while Mung-Mung, also published in 2004, was a foldout book that introduced very young readers to the world of animal sounds. (Mung-mung is Korean for woof-woof.) In addition, Park kept up a steady pace of travel, visiting libraries and giving book readings. Her schedule, however, was much less hectic than it had been immediately following her Newbery win, which meant she could spend more time at home in upstate New York, a home that she shares with her husband, two children, a dog, a hamster, and eight tadpoles. When Durango asked Park if there were more books on Korean history in store for readers, the author replied, "I feel like I've only dipped my big toe into the possibilities of stories from Korean history! Like most writers, I have a lot of other interests as well—I don't know yet which of those will lead to books, but I can't wait to find out!" Park, Linda Sue. The Kite Fighters. New York: Clarion Books, 2000. ——. Seesaw Girl. New York: Clarion Books, 1999. ——. A Single Shard. New York: Clarion Books, 2001. ——. When My Name was Keoko. New York: Clarion Books, 2002. Scotto, Barbara. "Review of Seesaw Girl. " School Library Journal (September 1999): p. 228. Durango, Julie. "A New Book and a Newbery for Linda Sue Park." By the Book (April 23, 2002). http://www.geocities.com/juliadurango/btbpark2.html (accessed on July 23, 2004). Durango, Julie. "Seesaws and Kites: An Interview with Linda Sue Park." By the Book (July 8, 2000). http://www.geocities.com/juliadurango/btbpark.html (accessed on July 23, 2004). Goodnow, Cecelia. "A Moment with ... Linda Sue Park, Children's Author." Seattle Post-Intelligencer (March 17, 2003). http://seattlepi.nwsource.com/books/112580_mome17.shtml (accessed on July 26, 2004). "Interview with Linda Sue Park." Alsop Review. http://www.alsopreview.com/aside/lsparkinterview.html (accessed on July 26, 2004). Linda Sue Park Official Web Site. http://www.lspark.com (accessed on July 22, 2004). "Linda Sue Park Who-File." Time for Kids. http://www.timeforkids.com/TFK/specials/story/0,6079,199125,00.html (accessed on July 23, 2004). "Q&A with Newbery Winner Linda Sue Park." Writer's Digest Magazine. http://www.writersdigest.com/articles/interview/linda_sue_park.asp?secondarycategory=Children's+Subhome+Page (accessed on July 23, 2004). Smith, Cynthia Leitich. "Interview with Children's and YA Book Author Linda Sue Park" (March 2002). http://www.cynthialeitichsmith.com/auth-illLindaSuePark.htm (accessed on July 26, 2004).